You have called me from the pit and raised me up by your strong and mighty right hand. You placed my feet on solid ground – a lasting foundation of hope.I will not fall, for I lean on you, my Cornerstone. The morning dawns, I awaken to thoughts of you. I see you in everything – everywhere I go. I see your face in flowers, in the landscape, in the clouds and by the sea – your beauty is reflected in all creation. I feel your touch as the sun lights on my face and wraps me in your warmth. I weep at the thought of being alone – of being separated from you. You are all I need and more. I have desired you with all I am. I seek you with all my heart. You are with me in soul and spirit. Your counsel is my comfort; your wisdom is my strength. You shower me with love and tender mercies every morning. You have put my past far from me and set my eyes on tomorrow – a future with you – eternity. Your blessings are countless. I speak of them often to those you set before me, a testimony to your unfailing love. My love deepens with the knowledge and wisdom you impart to me. Your Word illuminates my life. I am filled with you. Your promises sustain me. 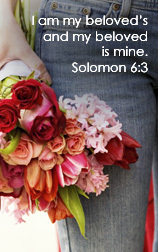 I am complete in you alone, my true love, my Saviour, my God. Blue skies darken. A stark gray moves in slowly as the clouds engulf the sun. Cold winds pass through me. The day is hardened. A new season begins – trials and tribulation abound.My heart beats for you and I trust. My enemy stands against me, tormenting me. Fear knocks – I dare not open the door. Announcing a grim destiny – but you offer eternity. My heart beats for you and I turn. Hanging on. Counting on – your saving words. I battle from victory. Believing is seeing. He relents. You remain. My heart beats for you and I rest. The light of dawn shines forth from the east – a refreshing mist … a rainbow of promise. Your presence follows. My heart beats for you and I worship. From existence without life – my past washed away by your love. Forgiven. Restored. Reconciled. My heart beats for you and I rejoice. In your arms, your strong right hand – your protection, your healing, your promises and peace. Life reborn. My heart beats for you and I serve. She lived in a frigid room for nine months. There were no belly strokes, no songs sung, only the negative vibrations filtered down through the lifeline. Unwelcome. It frightened her – reluctant to stay and equally reluctant to leave. What if the outside was as uninviting as the inside? She was not chosen. There was nothing between the donors but anger and resentment echoed by the shrill but unspoken words between them. I don’t want to be with you. You make me sick. But the worse words of all meant to curse the womb – I don’t want this baby – your baby. A shock reverberated to the depths – stinging, poison, scarring the one within – a sentence meant to deliver a death blow. Little chance. Little hope. Deeper than the pain that seared to her core, a small beating heart began to pound. She began to move, making her way into the cold arms of a stranger. Before it all – a seed sown that would one day grow. There was hope. She had been chosen by someone. She would light up His life.